Peel Vets|Advice|Equine|Sweet Itch – A Summer Problem. It’s that time of year again, the weather is starting to warm up and the flies are coming out in force, meaning itchy irritated horses and skin conditions. So what is Sweet Itch and what can we do about it? Sweet itch is the common name for the allergic response to bites from flies, mainly the Cullicoides midge. 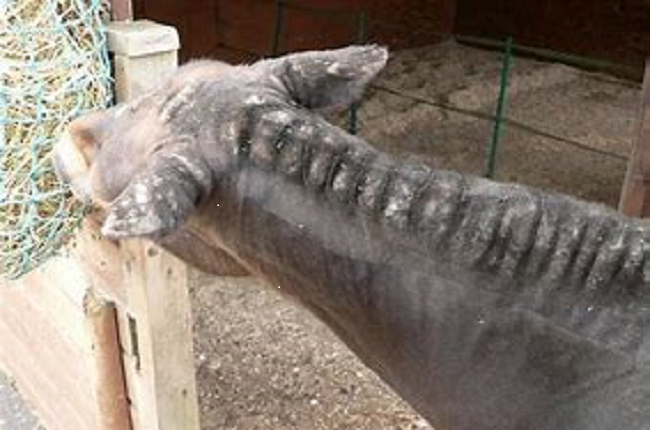 The body overreacts to these bites and causes intense itching, causing horses to rub and skin damage to occur. Horses become irritated by the presence and biting of the midges and this can interfere with their comfort. Horses are most at risk at dawn and dusk, on overcast days and when grazing near water, long grass or trees. These are the favoured conditions for the midge. In these conditions, horses may be bitten hundreds or even thousands of times in just one evening. Horses are mostly affected in the regions of the neck and rump, near the mane and tail. Horses may be seen rubbing or biting at their skin. They may be restless and unsettled, swishing their tails and even rolling on the ground. Horses may stand together, grooming each other excessively. Sores may be seen resulting from these behaviours, which can become painful and infected. Prevention is certainly better than cure and there are several things you can do to reduce the likelihood of your horse suffering with Sweet Itch. Picking suitable grazing locations or bringing horses away from unsuitable locations at dawn and dusk, when midges are most active, can really help. You can also provide a barrier to midge bites, such as fly sheets, masks and rugs – but make sure these are suitable for midge prevention and not just larger flies. Insecticides can be used to deter flies from landing on the horse. The midge chews on the skin, so insecticides can be very effective and deters this. When Sweet Itch has taken hold, we recommend preventing further midge bites. Sores should be cleaned and veterinary advice sought about their treatment. We may recommend antibiotics, anti-inflammatories, topical treatments, sprays or shampoos. There are medical options for controlling itching, some with potential side effects, so examination of your horse by a vet is sensible so that the correct treatment can be chosen. This article is not intended to replace individual veterinary advice for your horse or pony. If you have any questions or would like to speak to a vet about Sweet Itch or any other problem, please do not hesitate to contact us at the surgery.